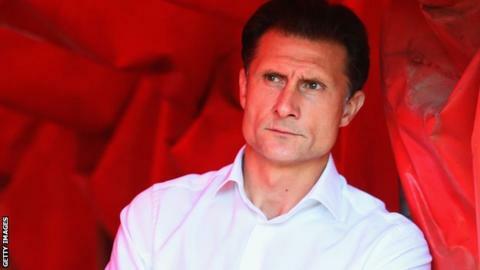 Torquay United manager Chris Hargreaves has apologised to the club's supporters after their 2-0 FA Cup fourth qualifying round loss at Aldershot. It is the first time in the Conference club's history that they have failed to qualify for the first round proper of the competition. "I can only apologise because that performance does not reflect me as a player or a manager," Hargreaves said. "But it's my team, my name is above the door," he told BBC Radio Devon. "I have to believe that this group can turn this round and I will believe that." In their two previous seasons on the Conference between 2007 and 2009, the Gulls made the second round and the fourth round respectively. Hargreaves captained the side in 2009 when Torquay narrowly lost to then-Championship side Coventry City having beaten league club Blackpool in the third round. "As a player and captain of this club I enjoyed some fantastic support. We narrowly missed out on a fifth round tie," Hargreaves emphasised. "To say I'm not happy is an understatement. If I could afford it, I would give all their fans their money back. "I thank them fro their support, it's fantastic, we've got some of the best away support in the country, they're magnificent."